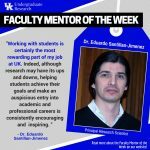 Chad Risko, an assistant professor of chemistryin the University of Kentucky College of Arts and Sciences, didn’t always know there was a career to be had in doing research – until a mentor encouraged him to study chemistry as an undergraduate. For many, the idea of a chemist brings about images of someone working behind a bench in a white lab coat, mixing chemicals together. Risko, who studies materials chemistry through computation and theoretical modeling, says that’s not the case in his work, as his chemistry is done on a computer. 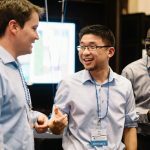 “We try to take knowledge from quantum mechanics, classical mechanics, chemistry, materials science and engineering, and other disciplines and bring them all together to provide a really fundamental understanding of new synthetic materials that are of interest for electronics applications, and for energy conversion and energy storage,” he said. The chemistry of batteries, from small lithium ion batteries to large grid-scale storage, and organic electronic materials are major topics of study, as he and his team aim to help colleagues from across disciplines understand and design new materials. By starting at the atomic level, Risko and his team use computer simulations to examine the different possibilities of a material. They are then able to share this information with their colleagues and make recommendations to them. “Our goal, in the end, is to make the design of new materials more efficient,” he said.